The Central African Republic, or Centrafrique is a landlocked country in Central Africa. 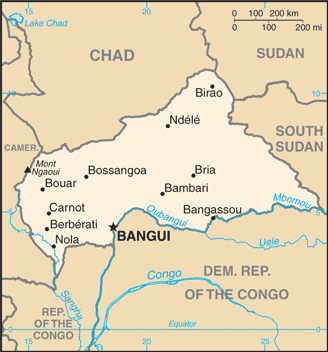 It is bordered by Chad to the north, Sudan to the northeast, South Sudan to the east, the Democratic Republic of the Congo to the south, the Republic of the Congo to the southwest and Cameroon to the west. The CAR covers a land area of about 620,000 square kilometres (240,000 sq mi) and had an estimated population of around 4.6 million as of 2016.